First comes November, and the humans have a big feast! They cook and they cook and they cook. Then they eat and they eat and they eat. Then they eat some more. And sometimes I get a taste as well. After that comes the season of hunting. The humans are always gone. They come back with these bags filled with stuff. Or sometimes boxes of stuff is offered by the Man Who Wears Brown. The humans put festive paper on the stuff and put it under this tree they bring inside. Anyway, after a month of great hunting, they have another feast. They cook and they cook and they cook. Then they eat and they eat and they eat. Then they tear the festive paper off all the stuff and look at it. Then they eat some more. Sometimes I get to tear the festive paper off the stuff too. And sometimes there is something for me inside! It’s so exciting! I love Christmas! In the late fall, the humans begin their hunt. They score many trophies, then hide them inside bright paper and bags. They decorate their homes to show others their prowess at gathering stuff. Always the opportunist, I check out their spoils to see if there’s anything I might want for myself. I tear the paper. I pull everything out of the bags. I puke on it. I claw the things to leave my mark. Then I climb inside a fake tree and hide. Then comes a day of feasting. They try to banish me to the dungeon that they call a bedroom, but I am too smart for them and I climb on top of a bookshelf. I stare down at them with contempt. Then, when they are so busy eating they forget about me, I jump down from the shelf, up on the table, and steal a tasty morsel for myself. Losers! After the feast, the humans share the spoils of their hunts with one another. They tear off the paper, and I jump on it to make sure it’s dead. The humans appear particularly pleased that each trophy has the scent of me. And then I take a nap. Bah humbug! Ha – and happy Christmas to you all! Reason why I’m allergic to cats… sorry June… It’s not you, it’s me. I just can’t deal with so much negativity in my life, right now. THIS is the TRUTH about the season…. except you left out the JOY of Annual CARD COUNT…. which WE always WIN. Parallel universes that humans straddle trying to please each’s whims. Purrfectly delightful. Big woof! Hahaha make sure it’s dead :’) good work! I wouldn’t know about the cats; but then again, Ducky sometimes cops a feline-like attitude. LOL. Callie and Shadow are good doggies (most of the time). 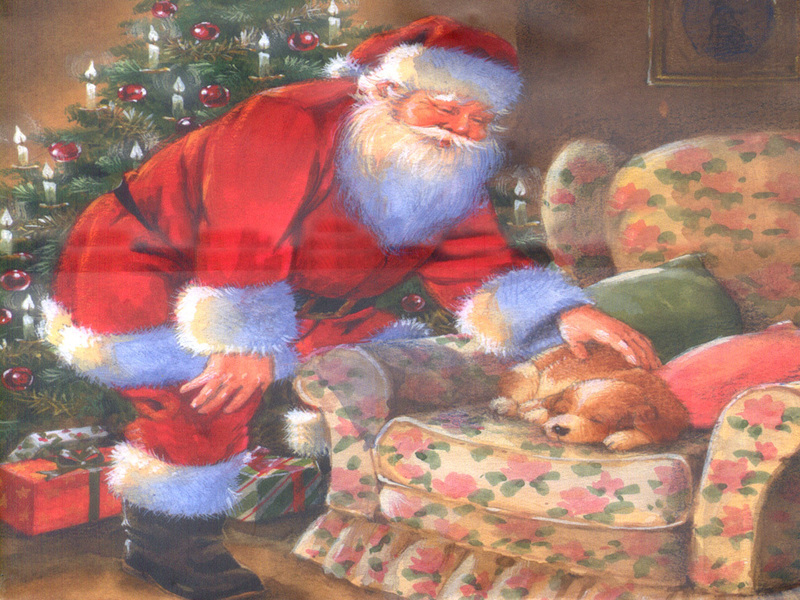 My dog would go crazy at Father Christmas’ beard if she were to encounter it. She already keeps trying to rub chins with my son’s close beard! Nailed it!! Mom does a lot of online “hunting”. Sounds like good fun for everyone, but maybe those dogs and cats need to eat, eat, eat some more! Come on peoples, feed these poor little guys. 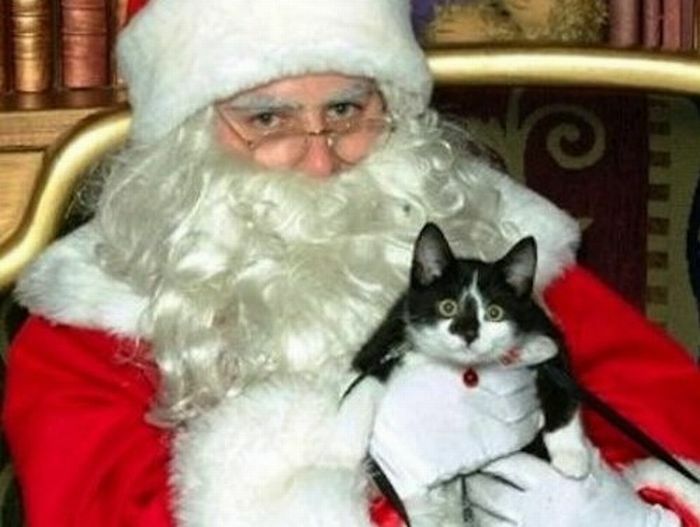 Love the pic of the cat with Santa–he looks like he’s getting goosed! In regards to how cats view Christmas, you missed the VERY important part about how all these interesting, shiny things dangle off the tree for their amusement. My cats would spend hours batting at the ball ornaments and don’t get me started about the tinsel….that stuff is very, very bad for the kitties but oh how they love its stringy goodness. I’m looking forward to the food. And then a bit more food. Cute! What do you think the cats think of all the shiny danglies on the tree?